Book a seminar on organizational safety with our full list of seminars. Each year we conduct a number of public and in house seminars on a variety of topics. We have highlighted just a few of our more popular topics and then listed just a few more for your review. If you have a topic you would like us to cover we will be happy to develop the seminar for you. Most seminars are given by Gary A. Higbee EMBA CSP an internationally known safety professional and public speaker. 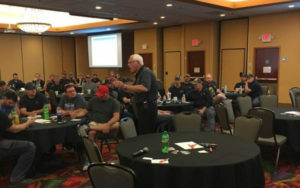 Gary is a frequent speaker at international safety conferences such as the National Safety Council Congress, the American Society of Safety Engineers Annual Professional Development Conference, the International Accident Prevention Association Annual Conference and regional conferences all over the United States and Canada. This session is a fun, fast moving look at what it takes to become a world class safety organization. Fasten your seat belt and go along for the ride as Gary uses stories, examples and humor to bring home the point of what it takes for excellence in safety performance. The Solution – Breaking the Cycle of Risky behavior starts with a discussion of accident causation and how different types of safety program try to address those accident causation issues. Have you ever wondered why people do the things they do? Now is your chance to find out as Gary addresses not only why people do what they do but why they think what they do make sense. This changing of poor safety behavior to good safety behavior is very difficult to do given poor behavior makes sense to the people doing it and most of the time they actually get away with it. Discover how you can change and influence behavior through significant events, risks and consequences. Gary pulls it all together with an explanation of the five stages and how they fit together to promote world class safety performance. As a bonus the last part of this session will cover the four states and four critical errors that cause “all” accidents and how awareness can be raised to level that prevents injuries even when compliance issues have not been resolved. You and your employees will experience a significant change in safety awareness that will result in fewer injuries. Safety is definitely part of the supervisor’s and Team Leader’s responsibility and in most cases the hardest part to focus on. Reason being the visibility of production, quality and cost (always measured by the supervisor and always known) while safety is invisible (seldom measured by the supervisor and seldom known) unless an accident has occurred. During an injury investigation one of the first persons the regulatory agency wants to talk to after the safety person is the supervisor of the injured person. Supervisors can and often do give instructions that put them at risk for personal liability. Gary will discuss some of the cases he has been involved in as an expert witness where supervisors were personally sued for their actions or inaction. If they have been allowing things to go on that make them a little nervous now is a perfect time to stop, correct the situation and a great time to start living up to all their responsibilities. Your supervisors will have a whole new perspective of their safety responsibilities. 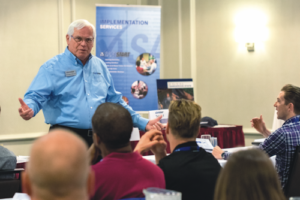 The instructor Gary A. Higbee EMBA CSP has become an international expert on safety performance. This session has been delivered at the World Safety Conference and in nations all over the world. No matter what country you’re in or what the safety legislation contains the overall safety requirements are the same when looking for world class performance. Even if your immediate safety goal is somewhat short of world class you will still benefit from this session from a continuous improvement perspective. This session will help you understand what it takes to be a world class safety performer. Katrina. Rita. The tsunami. The London Bombings. 9/11. These and other recent disasters-natural and man-made-have tested health and safety systems like nothing before. What can we learn from these experiences that will enable us to do a better job of protecting not only our workers and our businesses but our homes and our loved ones?